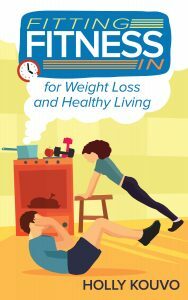 You’ve heard that managing your weight is all about the lifestyle, and not the quick fix, so today I’d like to give you 7 habits that fit people have. These following 7 habits are held by successfully fit people…wonder if you could apply a few to your own life. If you’ve ever wondered why you can’t quite get fit, it may be your proclivity for caving to pressure. And that pressure may be self-induced. Fit people do not give into excuses for why they shouldn’t exercise. Quite the contrary. 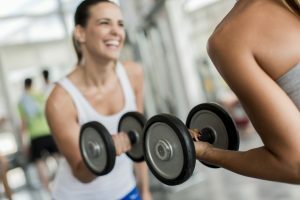 They are continually finding reasons why they should hit the gym and find pockets of time to do it-even if the trip to the gym is shorter than usual. For some, keeping tabs on health progress is about as exciting as watching paint dry. Once you get into the routine, however, you will become a believer in the power of tracking your progress. Tracking serves to both reward and motivate you, as you see that the countless hours in the gym and smart food choices lead to a healthier weight and greater strength-a.k.a. better overall fitness and health. It can be easy to mindlessly run on a treadmill at the gym if you’re not careful. Just remember that fit people don’t do such a thing. They are very intentional about everything they do at the gym. This means if you want to be fit, you should put some brainpower into what you include in your workout and how you perform each repetition. This allows you to get maximum benefit from your gym time and reduces the risk of injury. The final thing fit people do is rely on someone with lots of know how in the realm of fitness. This is why my clients have such a high success rate in achieving their goals – because I make sure that they stick with it! I have a sincere interest in your overall health and well-being and know how to help you reach the goals that can seem so far away when you’re trying to achieve it on your own. Holly Kouvo is a certified Personal Trainer, Nutrition Specialist, Functional Aging Specialist, speaker and writer. What is a Tabata workout? Tabata training is a high-intensity interval training (HIIT) workout, featuring exercises that can last up to four minutes. Tabata training was discovered at the National Institute of Fitness and Sports in Tokyo by Dr. Izumi Tabata and his team of researchers. They conducted research on two groups of athletes. The first group of athletes trained at a moderate intensity for one hour, five days a week for six weeks. The second group of athletes trained at a high-intensity for 4 minutes 20 seconds with 10 seconds rest between exercises, four days a week for six weeks. 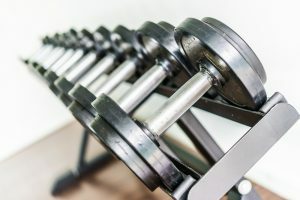 The results showed that the high-intensity workout had more impact on the athlete’s aerobic system (cardiovascular) and the anaerobic system (muscle) than the moderate intensity workout. When I design a program for clients, I look at how much time they have to workout and what their goals are. I often design a 15-minute workout that starts with a warm up, then a 2-cycle Tabata workout, next some abdominal work, and ends with stretching. Since most of my clients are not athletes, I modify the Tabata workout slightly to make it achievable. When a client starts out, they do not have to go as fast or as intense as the traditional Tabata workout. As they become more fit, they make the workout more intense. I have found that using an App on your smartphone for the timing keeps you moving along quickly without unnecessary breaks. There are several Apps available; some have music that adjusts the beats per minute based on the interval phase. It is always good to change up your exercise program. Adding in a Tabata workout is a great way to get variety and give you a more intense program. 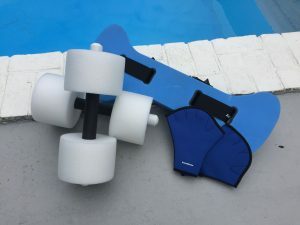 Turn your pool into a gym by doing your workout in the water! Living in New England, I like to embrace the different seasons by changing up my workouts seasonally. In the summer, make use of your (or your local) pool and get your workout in while getting some sun at the same time. Pool workouts are great for many reasons: they are effective at working the muscles, they are easy on the joints, and, they are sweat-less! I have the luxury of sitting by my pool while writing this post. Luckily it is not too hot yet! Water adds 12-14% more resistance than the resistance felt when you exercise on land. Water provides multidirectional resistance. Since your muscles generally work in pairs, the water allows your opposing muscles to work at the same time. It provides a more functional workout. The water adds buoyancy, which allows many people to do movements that they may not be able to do on land. Water regulates your temperature so you do not overheat. Water can be used for rehabilitation when injured, as well as to prevent injuries. The Aquatic Exercise Association states that your body, when immersed up to the chest, bears 25-30% of your total body weight. Immersed up to your waist, it bears 50% of your body weight. The more immersed in the water you are, the less impact it has on your joints, however, the more immersed in the water, the less control you may have on your movements. You do not need a lot of equipment. You can get a good cardio workout just swimming with a noodle or kick board. If you want to get a full body workout, you may want to purchase some water weights, maybe a water running belt, or even water gloves. Most water equipment comes with instructions on exercises you can do with the equipment. If you want to see a sample water workout, stay tuned for my next episode of “Get Healthy with Holly” for the video of a full water workout. Let’s face it, most of us start an exercise program to lose weight! Yes, there are the few health-conscious people who start exercising for their health and I applaud you. 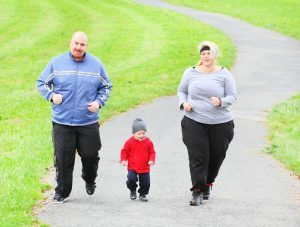 For the rest of you, exercise is a way to attain your weight loss goal. Some have more weight to lose than others. Once you get started on your exercise program, you start to feel better, stronger, and more energetic. 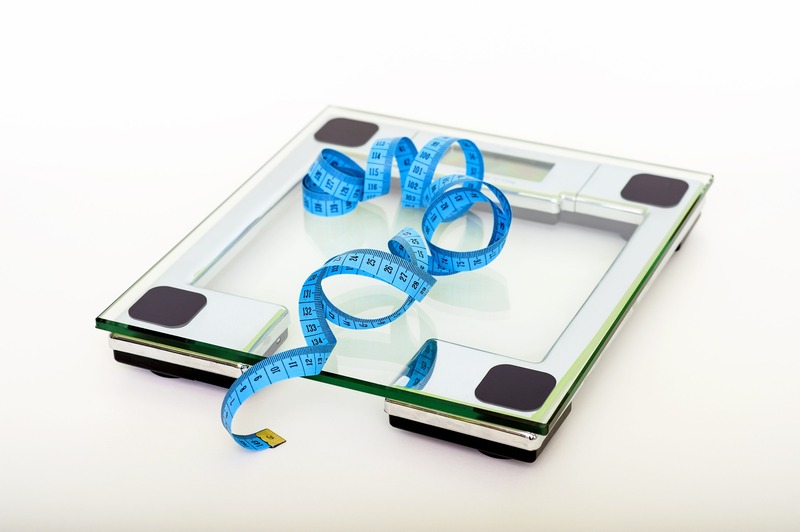 You may not have lost weight, but you are already seeing the health benefits. York University in Toronto conducted a study (BMC Obesity 2017; doi:10.1186/s40608-018-0183-7) which evaluated the cardiovascular health benefits of fitness for people with mild to severe obesity. The results showed that “you can get fit without losing weight and have health benefits.” In the study, patients attended a weight management clinic and researchers evaluated their fasting blood measures and maximal treadmill stress test results. Their data showed that individuals who were more fit were less likely to have high glucose, triglycerides, and blood pressure regardless of their weight when compared to people that were less fit. The study shows that having a high fitness level is still beneficial even if your BMI (Body Mass Index) is 40 or higher. So, get out there and move and keep moving. Yes, you can be fit and fat! Do you sabotage your efforts with food? Why is it we could do such a great job of getting to the gym (or at home) and work out, then sabotage our effort by eating poorly? You spend an hour working out doing strength training and cardio and you feel great afterwards. Do you then say to yourself, “I did my workout, now I deserve a treat?” How do you feel after eating that treat? Does it make you feel better? Does it move you closer to your goal weight? Are you mad at yourself for eating it? Why do we eat it? One of the things I noticed when I started to take my workouts seriously was my attitude towards food. I no longer looked at it as a treat or thought about how good my dinner was going to taste. I looked at food more as fuel for my body. I had muscles and I felt good about my body, I did not want to feel crappy by eating fat laden food or a lot of sugar. My food still tastes good. It is healthy and good tasting! I teach my clients to eat supportively. Eating supportively means eating every 3-3.5 hours, eating smaller meals that consist of a lean protein, a starchy carbohydrate, and a fibrous carbohydrate. This is a meal that is highly thermic. A thermic meal is one that causes your body to burn a lot of calories when digesting it. Ideally you want to make every meal as thermic as possible. By eating every 3-3.5 hours, you keep your metabolism burning at an even rate all day long. Really, the key food to eat which will benefit you the most is lean protein. If you only have time for a quick snack, make it a lean protein snack (preferably one without a lot of sugar). When I know I will be in my car all day going from one class or client to another, I plan for my snacks and pack an insulated bag with my water bottles and my snacks. Sometimes my snack is a small portion of almonds or a Greek yogurt. Sometimes I make more of an effort and pack up some whole wheat crackers, cucumber slices, and rolled up “all natural turkey” slices. I will put my little snack together and eat it in my car. I think the key is to change how you look at food. Change your attitude towards it. Think of it as fuel for your awesome body. Your body needs healthy fuel to be able to do the workouts you want to do (or need to do if I have assigned them to you 😊). Also, if you do get off track, restart immediately. Don’t think that because you already messed up you can continue eating that way for the rest of the day. 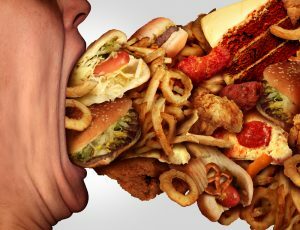 Before putting food in your mouth stop and think, will this be good fuel for my body? I think you will find yourself eating healthy more. Once your body is used to healthy food, when you eat something that is not so healthy, your body will let you know. Stop sabotaging your efforts, change the way you think about food! A bucket list is a list of all the goals you want to achieve, dreams you want to fulfill and life experiences you want to experience before you die. If you haven’t made a bucket list I highly recommend you make one. It won’t cost you anything, but it will give you clarity on what you want out of life. It is important that you don’t limit yourself by cost, logistics or lack of someone to join you for these adventures. Just write them all down and get them on paper. The list could go on. You could have over 100 items on your bucket list. What if you want to climb a mountain or go scuba diving? Would you be at a fitness level to do these items on your bucket list? Don’t wait until you are de-conditioned so much that you can’t walk around a city all day while traveling in Europe. Make sure you are exercising now and doing strength training so that you can walk on those unstable surfaces on the mountain trail or be able to get on and off a boat to go out to the coral reefs to see the best marine life. 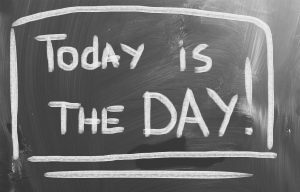 Don’t wait to start exercising and build up your stamina and strength to do the things you want to do. Join an exercise class near you. 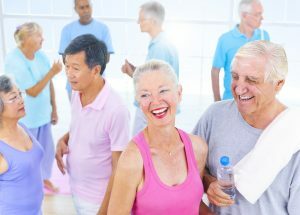 If you are a senior, there are plenty of senior fitness classes in your area. Take advantage of them and improve your fitness level so you are able to do what is on your bucket list. Travel is big on my bucket list. I want to go to Ireland, cruise through Alaska and see the Redwood Forest. Where do you want to travel? With the advanced medicine we have today, an extra 30 years could be added to your life. The question is will you still have a high quality of life during those extra 30 years? Functional longevity is maintaining the ability to do what you NEED to do, what you WANT to do and what you LIKE to do as late in life as possible. It is possible to be healthy, robust, energetic, vibrant, and functional well into your 80’s, 90’s and even 100’s. Banana George Blair water skied bare foot at 98 years old. There are two types of aging. Primary aging (biological aging), is the aging process where we are born, mature, peak, decline, and die. It is the inevitable cycle of life. Secondary aging (lifestyle aging), is the aging process that is secondary to our lifestyle choices – nutrition, physical activity, stress, and environment. 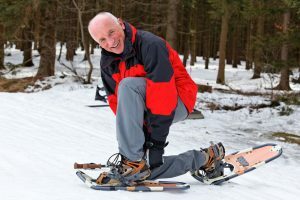 Extensive studies on astronauts and Master’s athletes have made it very clear that most of the negative aspects associated with the aging process are due to the secondary, and not primary, aging. Functional decline is due more to your lifestyle than your biological age. Genetics only account for 25% of the aging process. The other 75% is up to you. At what age does someone become “old”? Have you found that the age you consider old keeps moving? “Old” isn’t’ a number. It is a state of mind. If you look at yourself as old, then you will be. It is a self-fulfilling prophecy. How can you ensure your functional longevity? Exercising (cardio and strength training), eating a healthy diet, and trying new things will help to increase your functional longevity. The more you actively engage in life, the longer you will be functional. If you are retired, get involved in Senior fitness classes in your town. Keep your brain actively engaged by doing jigsaw or crossword puzzles, Sudoku, or go online to Luminosity.com or BrainHQ.com and play their brain games. Accept your chronological age without letting that age limit who you are and who you want to be. Ways to deal with Stress and Anxiety! Experiencing some anxiety is normal in life. However, according to the Mayo Clinic “People with anxiety disorders frequently have intense, excessive and persistent worry and fear about everyday situations. 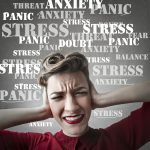 Often, anxiety disorders involve repeated episodes of sudden feelings of intense anxiety and fear or terror that reach a peak within minutes (panic attacks)”. This level of anxiety can certainly interfere with your health and needs to be treated. If you experience this level of anxiety, it is best for you to talk to your doctor. Sometimes anxiety may be linked to underlying medical issues. For others, you may have some stress and anxiety at different times in your life. Certain situations can also trigger stress, such as a death in the family, buying a house, or changing jobs. How do you deal with stress? A lot of people handle it by eating. The foods they are eating out of stress are not usually healthy, with potato chips being the main offender. The crunching of hard foods helps relieve the tension in your jaw; therefore releasing stress. You can always eat a carrot to get the same crunching relief! There are several foods that help reduce stress. The amino acid tryptophan helps your body produce serotonin (the mood enhancing chemical in your brain that will help you to relax and feel calmer). Eating complex carbohydrates can help with the absorption of the tryptophan and elevate your levels of serotonin. Vitamin B6 helps the brain to produce serotonin, dopamine, and melatonin. Dopamine is a chemical that also controls our mood and melatonin helps the body to sleep better. To get a good, healthy dose of both tryptophan and vitamin B6, eat a banana! Magnesium helps to relax your muscles. When you are stressed, the muscles in your body tighten. Eating foods that are high in magnesium (like avocado!) will help to relax your muscles and ease your stress. Both bananas and avocados have a smooth consistency. That smooth consistency helps to soothe our mood. I tend to exercise to relieve my stress. It is a great way to work off steam, and you will likely feel better once you have done it! I highly recommend it as a way to deal with stress. Next time you are stressed or have anxiety, don’t turn to alcohol or unhealthy foods, try exercising and eating one of these stress-reducing foods! A 15 – Minute Workout? Some of you are reading the subject line and thinking, “You can’t get a good workout in 15 minutes!” However, some of my clients already know that you can because they are doing it now. The way you work all of these components into your workout is by doing functional exercises that work several muscles at the same time. For example, an exercise called the “Wood Chop”, has the exerciser holding one weight in both hands, lifting the weight up over the shoulder on one side and then bringing the weight down and across the body, squatting down and lowering it towards the floor on the opposite side. If you do 15 repetitions on each side you will see that not only are you working your shoulders, chest, legs, and obliques, but you are getting a bit of a cardio workout as well. When you string several of these types of exercises together with some abdominal specific exercises, they will make up the majority of the workout. Then you need to make sure to stretch the muscles that you use. You can make it even more challenging by adding a timing component. For example, do as many of this exercise as you can in 30 seconds. You still need to make sure that your form is correct, so that you don’t risk injury when working a timed workout. Knowing the right exercises to do, especially if you have any physical issues you need to work around, requires a trained professional. It is important to work with a personal trainer or physical therapist to learn the exercises that are right for you and your body. Can you get a decent workout in 15 minutes? If you want me to show you how, contact me at Holly@FittingFitnessIn.com. Get Back on Track with your Health and Fitness Goals! Here’s How. Start moving more. Get more steps in every day. Use a pedometer or tracking device that will track your steps. The American Heart Association says you should get 10,000 steps a day (that is about 5 miles). You may need to work up to the 10,000. If you work at a desk all day, your starting goal is 4,000 steps per day on work days and 6,000 steps on non-work days. After two weeks increase your goal to 6,000 steps on work days and 8000 steps on non-work days. Increase again in two weeks to 8,000 steps on work days and 10,000 on non-work days. After another two weeks increase your goal to 10,000 steps on work days and 12,000 on non-work days. Log your food. There are many apps now to log your food (Fitting Fitness In’s Online clients can log their food on our app). When you log it, you lose it! By tracking and seeing what you are eating every day you can make better choices. You find out what time of day you tend to eat more. You can monitor how healthy your choices are. Add resistance training to your workouts. Resistance training or strength training will increase your muscle mass on your body and in return increase your metabolism. Don’t be afraid of resistance training. You don’t have to buy heavy weights. You can do a lot just using your body weight (squats, lunges, push-ups, ab crunches).If you don’t know where to begin, work with a Personal Trainer. Personal Trainers will give you a customized program that will help you accomplish your fitness goals. Set an appointment in your calendar to work out. Don’t just say I will work out tomorrow. Schedule your workout in your calendar. I think first thing in the morning is the best time to work out because you get it done before you have any other distractions. However, I understand that is not always a good time for people. But schedule it, and stick to your schedule. These four things are key in getting back on track with your fitness and healthy eating goals. You want to get back into your healthy habits before the holidays and stick with them. Weight gain over the holidays is a whole other topic!